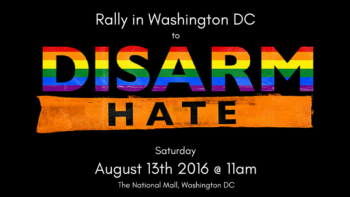 Help bring GVP and LGBT activists to Washington DC on August 13th to take part in the Disarm Hate 2016 Rally | Kind.Fund: Crowdfunding and fundraising for personal causes and charities. Following the tragic shooting at Pulse nightclub in Orlando that took the lives of forty nine people and injured 53 others, Jason Hayes, a celebrity hairdresser, decided that calling legislators, signing petitions, and making donations were not enough -- he had to do something different so he created a Facebook event page and asked his friends to join him to rally in Washington D.C. Within days, the Brady Campaign to End Gun Violence, Newtown Action Alliance and other organizations committed to cosponsoring the rally. The #DisarmHate2016 Rally is an opportunity to unite the gun violence prevention (GVP), LGBTQ, black, law enforcement and other communities to end all forms of discrimination and gun violence. Newtown Action Alliance (NAA) has taken a central role in supporting Jason’s efforts to organize the historic rally and we are working with Connecticut Against Gun Violence and Sandy Hook Promise to fill two buses from Newtown to travel to Washington D.C. on August 13th to push for change. Please help fund the rally and the buses by making a donation today! If you are interested in joining us in Washington, please sign up to get on the bus from Newtown, CT here. 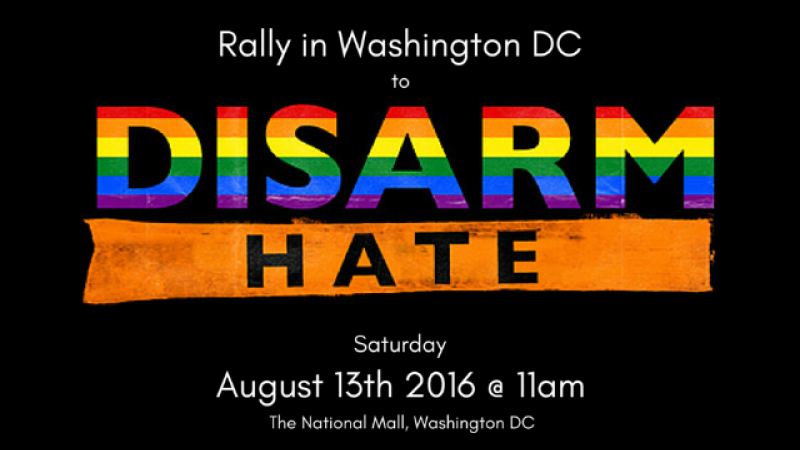 For further information on the rally, please visit DIsarmhate2016.